Eusebi Güell and Antoni Gaudi... What a relationship was it! Two men with love of art, patron of art and with sense of art. As a result Palau Güell came up in the middle of the city. Barcelona means Antoni Gaudi also. In most of the monuments, works of art or houses you will see the reflection of this fascinating architecture. Palau Güell was one of Gaudi's first works and it was built for Eusebi Güell as a mansion which was designed as private property urban palace on La Rambla. The house for was high class guests of Güell. Palau Güell family used Palau Güell as home until they moved to Parc Guell ( more info please click ). The house was designed for Güell's family's both private and social life necessities. The home is centered on a main room that guests were entertaining. The gate that guests entered was iron and they could enter the house with horse-drawn carriages. In the basement they could keep the guests' domestic animals during their visit and this place was used by also servants of the house. What is update about Palau Güell is it was used as a backdrop for the first meeting of Jack Nicholson and Maria Schneider in the movie called The Passenger by Antonioni. If you visit Park Guell don't forget to see Palau Güell also. What are the activities at Güell Palace? 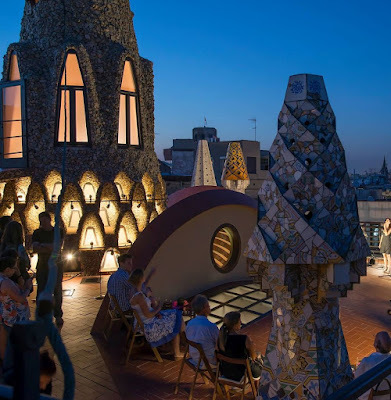 On the rooftop you can watch the concerts, performances and poetry reading. Also you can visit the museum. Please note opening days and hours of Güell Palace below. The entrance fee is 12€ but the other rates can be applied so check out http://palauguell.cat/sites/palauguell.cat/files/tarifes.pdf for ticket rates. For more Barcelona Travel posts please don't forget to follow us. Happy Barcelona city days! Here thank you Criticalandia for the Palau Güell video. If any copy violations please contact to us. Thank you.